A sweet bargain for the watersports enthusiast! X20 Full Wetsuit for the protective edge. A sweet bargain for the watersports enthusiast! X20 Full Wetsuit is rated 4.1 out of 5 by 10. Rated 4 out of 5 by Jim V from Lightweight Suit at a Good Price For light duty in warmer conditions. Rated 3 out of 5 by Bill from Great Price and Quality While the quality appeared to be great there was a problem with the sizing. I used the scale for height and weight that was provided when I ordered it, and I should have fit comfortably into an XL. When it arrived I couldn't get past my hips. I returned it and now have a back-order date of 5 months from now. Rated 5 out of 5 by Lorax from Summer Wetsuit at a GREAT Price Can't beat the quality for this price. All fabrics and stitching is A+. 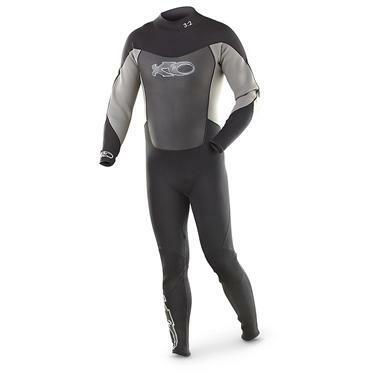 Rated 5 out of 5 by Tedx from All purpose light wet suit It is light and so maneuverable I would wear it under my clothing in a snow storm or hunting trip for extra insulation. It would not be good for cold water diving, but good for water sports and cool water diving. I live in Florida, so it's ideal. I generally wear X-large. Following advice from others, I ordered 2XL and it fits right. Rated 5 out of 5 by Flucky from Order it 2 sizes up. Fits well because I read enough reviews to know that I needed to order it two sizes bigger. I can't wait to get into the lake and test it. Rated 4 out of 5 by Mountainman from Great value The description does not do this suit justice. It is almost a full double lined (inside and out) except for the outside chest area. It varies from 3 to 2 mm thickness depending on the body part it is covering. Good for short duration, moderate to warm temperature sessions. Not suitable for SCUBA diving but can be used for snorkeling and free diving. The fit seems to OK, maybe one size small, allowing for the fact that a wet suit should be snug enough to keep water from freely running between it and the swimmers body.